Art- and documentary photography project: Tanzania Unlimited Ltd. Thank you for being here. I am Mathilde Jansen. Documentary and art photographer and mixed media artist living in Amsterdam. My work reflects on intercultural relations, socio-economic structures, international trade, the global economy and biodiversity. I set cross-connections between actualities, dreams and reality. Travelling through and living in such diverse places as Israel, Jordan, Egypt, Iran, Tanzania, Ethiopia and various European countries, I’ve observed the importance of economics in culture, art and everyday life. I’ve come to believe that economy is in this respect more powerful than politics. I’ve also observed that consumers represent the key of the economy. During this conference, I’d like to share a story about today’s life in Tanzania. 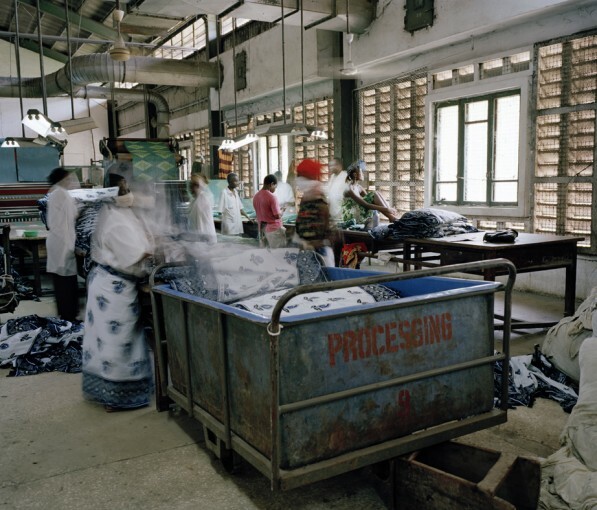 In 2008 I photographically documented the upcoming economy for my project Tanzania Unlimited Ltd. I traveled back in 2010 and portrayed personal and socio-economical structures, for another artistic series, titled Tanzania Revisited. And I will be working there in one month again, to prepare an international documentary project on nature, industries and the social and inner life of workers and traders who work with metals, iron ore and minerals. Before showing you some images of the art and documentary photography project Tanzania Unlimited Ltd., I’d like to introduce myself a little bit further, by telling you about one of my dreams. I am gonna mentally undress myself a bit now. I’ve been portraying export businesses in 2008, but it could have been yesterday: the growing economy is still relevant and actual. It’s rarely covered by news media though. Imagery of the African continent often still relies on a vision of around 1950, I think Africa’s inner independence is still in progress; economical and social equality should follow after political freedom. African countries often depend on western aid and foreign or Chinese investors. If we start thinking outside the box, we can imagine African countries to be suppliers of natural resources, and art craft. For China’s market, and for future western food markets, such as the Netherlands, which depends heavily on imports. The available land for farming is becoming increasingly limited. I have this dream, and I’ll share it with you. Because sometimes dreams come true, partly. As I’m born in a business family, I’m aware of concessions to be made and work to be done. It’s my role as an art and documentary photographer to envision parallel realities or dreams on the one hand, whilst observing and documenting real situations and actualities on the other hand. So I partly stage dreamscapes of innovation or understanding, based on and in interaction with reality on site. My artistic images stimulate imagination; new structures of today or tomorrow. At the same time my documentary images show that I’m not from Mars and that I’m in touch with reality. It’s my dream to see an Africa in which leaders and local communities collaborate equally with foreign politicians, countries and companies to stimulate economical and social welfare. African cultures consist of strong social networks. Strong citizenship can be realised and enriched through strong extended families. Many African countries are now dreaming of (more) wealth. But in fact this dream is hard to catch, as it’s wholly depended on the earth and the soil, which are in need of protection too. Because humans are just passers-by, spending a few seconds on this long living planet and its biodiversity. Who says it’s good to extract each drop of oil, to spill every inch of gold in a country, to exhaust all available land for food crops? What about people who are willing to maintain their ecological heritage or rely on sustainable policies for economical growth and social facilities? What will be left for their kids, how can the ancestors gaze down in content on a country? Will it be Africa, as we know it? Will African world heritage remain? I dream of combinations of modern and fair trade with traditional culture. For the real price of natural resources. How can one make art of gold, in which way are the African people experienced and strong, how do they face the darkness in the earth, are they proud enough to sell only the best pieces of copper they find? How can Africa be respected as a strong, independent continent. In control of its natural resources; slow and stable wealth, easy going growth, no problem life, informal business, you’re welcome my friend. African countries could supply natural and recycled products, art and craft, improvised techniques and hospitality service. The cheap, the most, the best products on demand, belong to the world of yesterday, in which luxury was available with a loan. If we want true and honest deals with African economies, we could listen to stories of people on scarce, improvisation and resilience. Or would it be provoking, am I provoking here, or open and honest? To me, sustainability is a funny word. It’s like saying to your partner: I don’t hate you, do you love me for it? Or saying to the world: I treat you with care, isn’t that great? On short term I’ll surely want my chocolate cookies but in the long term I’d like my child to have a good future. How can we truly understand the cultural traditions of local communities; people’s life’s and their natural surroundings? Or maintain so called sustainable economical structures, which I’d rather call ‘intelligent economical structures’. While being fully aware of challenges of today and tomorrow. Ignorance is very ‘nineties’. Today, you and I don’t live in a dreamworld, but in a quick world market with a growing population, mouths to be fed, people to be educated, workers to be trained, shareholders to be happy, conferences to attend, cars to be driven; houses and roads to be built. With people to produce and consume. Which way do we go? I am standing here instead of meditating in a cave. Is Africa a solution, and how can (local) people benefit? What is Africa’s role and and what are local stories of Tanzanian communities, entrepreneurs, craftsmen, workers, creative designers and international managers, taking part in this world economy? How does their daily life work environment look like, which positions do people possess, what dreams do they share, which problems do they face? How do people function in exporting companies? Within which cultural and geographical conditions do they operate? How does economical growth affect daily life of both locals and internationals? Project: Now I’ll show photographs of the project Tanzania Unlimited Ltd. The photography project portrays and reconstructs Tanzania’s multifaceted upcoming economy. And represents natural-, industrial- and cultural diversity and (socio-economic) issues related to exporting companies. Focusing on various industries, playing an important role in the economical and social life, active in the fields of manufacturing, mining, (cultural) tourism and agriculture. Start of the slideshow Tanzania Unlimited Ltd.